Terrorist opens fire from passing car at the Ammunition Hill and Shimon Hatzadik light rail stations. Two people were murdered, six injured. Two people were killed and six others injured after a terrorist opened fire Sunday morning opposite the police station in northern Jerusalem, according to reports by MDA and police. The attack took place at two different locations. 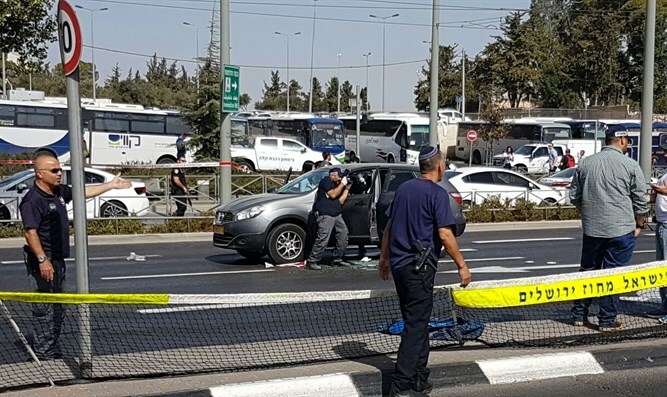 A white car stopped and opened fire at the Ammunition Hill light rail station, located at the Central Police Headquarters intersection, injuring those standing at the station. The driver then drove to the Shimon Hatzadik station and opened fire, wounding more passersby. He was then reportedly eliminated by a Special Patrol unit of motorized police as he tried to escape into the Arab Sheikh Jarrah neighborhood. Two of the injured are described as in moderate to serious condition, two are lightly injured. Two of them, a 30-year-old policeman and 60-year-old woman were described as in critical condition. They were evacuated to the nearby Hadassah Mount Scopus Hospital together with two other casuaties in moderate and light condition. Three more were evacuated to Shaarei Tzedek hospital, one in moderate condition and two lightly injured and another lightly injured person was evacuated to Hadassah in Ein Kerem. Another four people were treated at the scene for shock. MDA paramedic Aron Adler was one of the first to arrive on the scene with an MDA advance care motorcycle: "When I arrived on the scene on Haim Bar Lev Street, I noticed a 60 year old woman with shot wounds in her upper body. She was unconscious with no heart rate and didn't seem to be breathing. We provided her with lifesaving, initial medical treatment and transferred her onto an MDA intensive care vehicle. She was evacuated to Hadassah hospital in critical condition. "We then received a call about two more people wounded on Shimon Hatzadik Street so I immediately headed over there with my motorcycle. When I arrived I noticed 2 males in their thirties. One was conscious and had injuries to his limbs while the other was unconscious and suffered from wounds in his upper body. We quickly evacuated the two while hydrating them, stopping their bleeding, and medicating them for pains." A police spokesman commented on the attack to Arutz Sheva.